Objective: This page shows the steps to start Cloud Datalab from a Cloud Shell session. This technique can be used if you are unable to install Google Cloud SDK on an unsupported platform or device, such as a Google Chromebook. If you can install the Google SDK, follow the Quickstart steps instead of the steps in this guide to setup and launch Cloud Datalab. Start a Cloud Shell session from a Google Cloud Platform project. In the Cloud Shell session window, run the following command to create a Cloud Datalab VM instance. Make sure to select a unique name for the instance, which must start with a lowercase letter followed by up to 63 lowercase letters, numbers, or hyphens, and cannot end with a hyphen. Open your browser to the Cloud Datalab home page by clicking the Web preview button , and then selecting Change port→Port 8081. The Cloud Datalab home page opens in your browser. The connection to your Datalab instance remains open while the Cloud Shell session is active. If the Cloud Shell session window is closed or the session is inactive for 60 minutes, the connection will terminate. Restart the Cloud Shell session and then run the following command in the Cloud Shell terminal window to reestablish the connection to your Cloud Datalab instance. 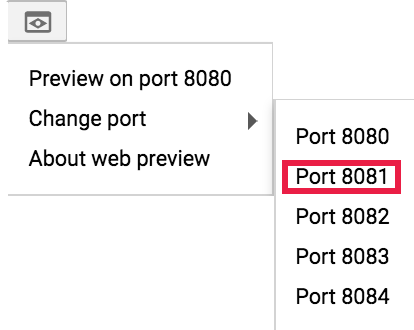 After reestablishing the connection, use the Cloud Shell Web Preview button to select Port 8081 to reopen the Cloud Datalab home page in your browser. Cloud Shell Usage Limits. Keeping your Cloud Datalab connection open in Cloud Shell for an extended period may result in a warning message that you are about to exceed Cloud Shell usage limits. If a limit is exceeded, your session and its connection to the Cloud Datalab instance will be closed.